It's fascinating when wines, with age, attain the aroma and flavor of a completely different type of wine from a completely different place. This Riesling can easily be mistaken for a great Chablis Grand Cru. The combination of minerality, acidity and focus reminds me of the sheer power of the great vineyards Les Clos and Bougros. But maybe this is logical since is the soil of Altenberg de Bergbieten is heavy, full of lime and barely warm enough. 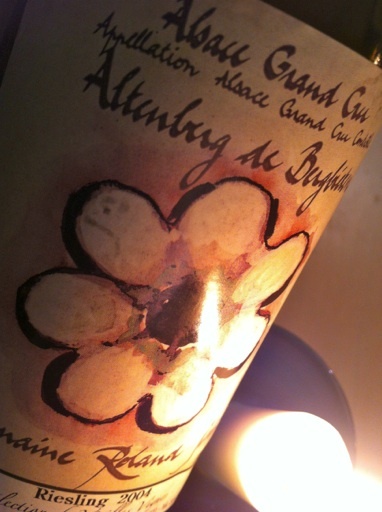 2004 Riesling Grand Cru Altenberg de Bergbieten from Roland Schmitt is golden yellow. The fragrance is overflowing of acacia, orange flowers, wet flint and one hint of green bananas. The taste is dry, powerful, rich and complex with a dominant minerality, grippy acids and an infinite and clear aftertaste. Dazzling. Surprising! Price (as of 2012): € 14.